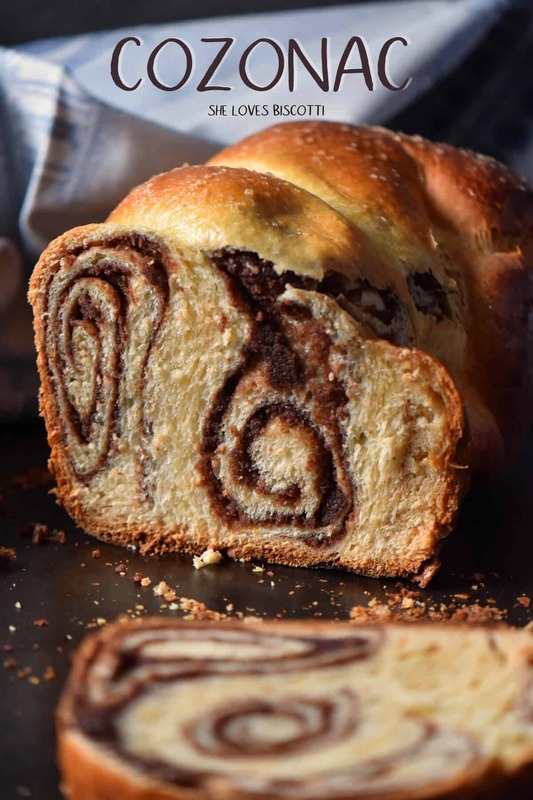 Cozonac is a classic, simple, sweetened yeast bread with origins in Romania. 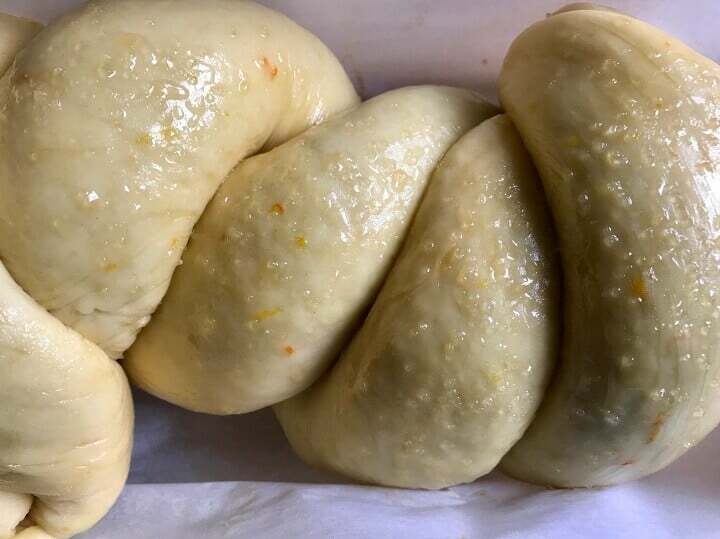 Traditionally made during Easter and Christmas, this citrus-scented sweet dough is twisted around a nutty filling, creating a spiral design when baked. The result is a festive loaf bread with a tender and soft crumb. As many of you know, I grew up in an Italian family where traditions and traditional foods and holidays were respected. As a result of this upbringing, I just love learning about different traditional foods! No better way to get to know a culture than through its cuisine – that’s what I always say. That’s why on a recent trip to Romania, I made my culinary mission simple: eat as many traditional foods as I could. One of those foods was Cozonac, a Romania festive bread, eaten at Christmas and Easter (another one is pasca… coming soon!) I’m sharing this recipe with you today to celebrate how much I loved it. Cozonac is a yeast bread, and even though it is definitely distinctly Romanian, it resembles a lot of other yeast breads originating from different cultures all over Europe and beyond. Greece has its tsoureki; France has brioche; Armenia has chorag; Bulgaria has kozunak; and Israel, of course, has its challah. In the past, I shared some traditional yeast breads from my native Italy, like this panettone recipe and this Easter sweet bread recipe given to me by a friend’s mom. 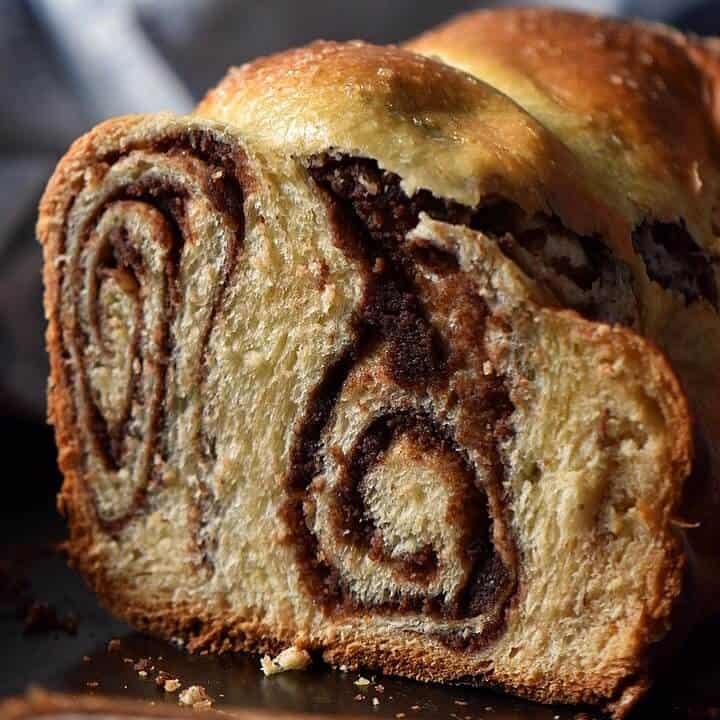 Compared to the yeast breads I have made in the past, Cozonac looks a little different, thanks to the nutty cocoa swirls that run through the center. The swirls look artful and complex, but just wait until you see how easily they come together – nothing could be simpler. Now, baking with yeast can be tricky, and can be a bit of a time commitment, but don’t let that scare you. I promise you that when you try this delicious Cozonac, you will feel like all of your efforts will be rewarded! Let me run you through this recipe so that you can see that yeast is nothing to be afraid of. As you may have guessed, there are two parts to this recipe: the dough and the filling. The process begins by whisking together the milk and sugar in a small sauce pan over medium heat. 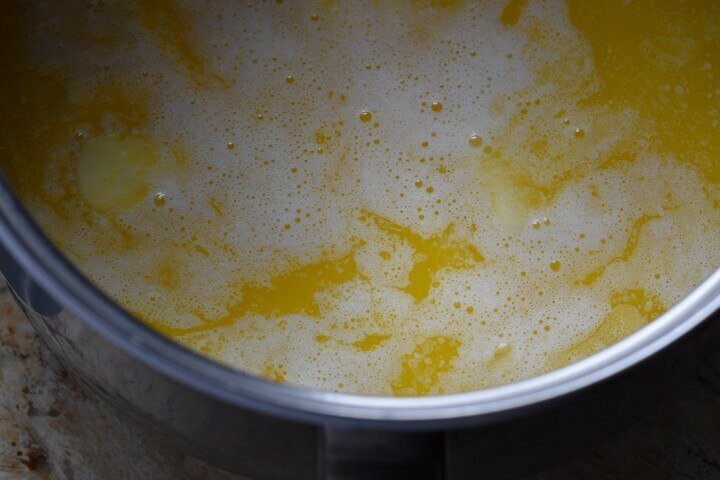 Add the chunks of butter and when they are almost melted, remove the pan from the heat and continue to whisk until completely melted. Set it aside for now. Please note that this “liquid” should be lukewarm when we add it to the dry ingredients. 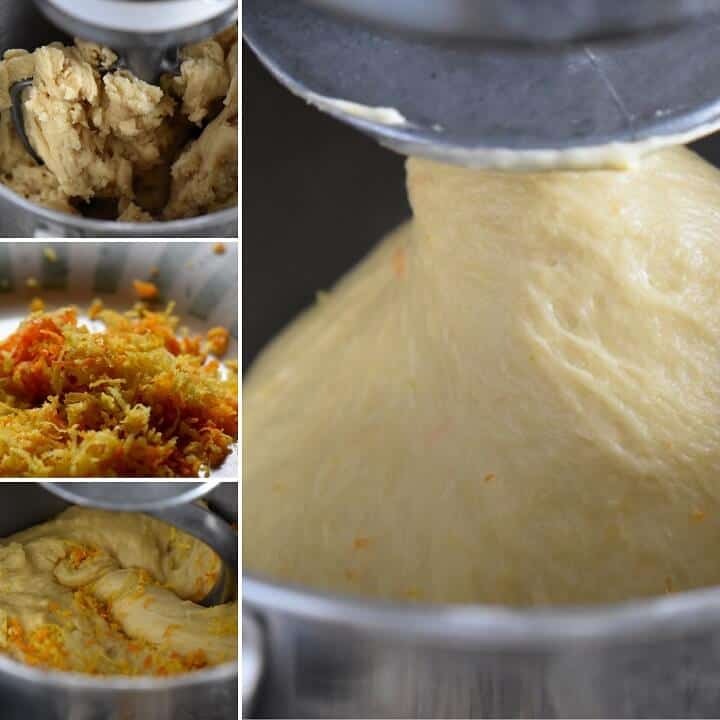 knead together for a few minutes, add the citrus zests and continue to knead for about 6-8 minutes or until the dough is smooth and elastic. The dough should pull away from the bowl. NOTE: If you find that the dough is still sticky, add a few more tablespoons of flour. Place the dough in a bowl lightly greased with butter. Turn the dough over in the bowl in order to completely coat the dough with the butter. Cover with plastic wrap and allow to rise for about 2 hours or until double in size. In the meantime, we will prepare the filling. The process of making this nut filling begins by whisking together the milk and sugar in a small sauce pan. Next, add finely ground almonds and stir until it becomes the consistency of a thick paste. 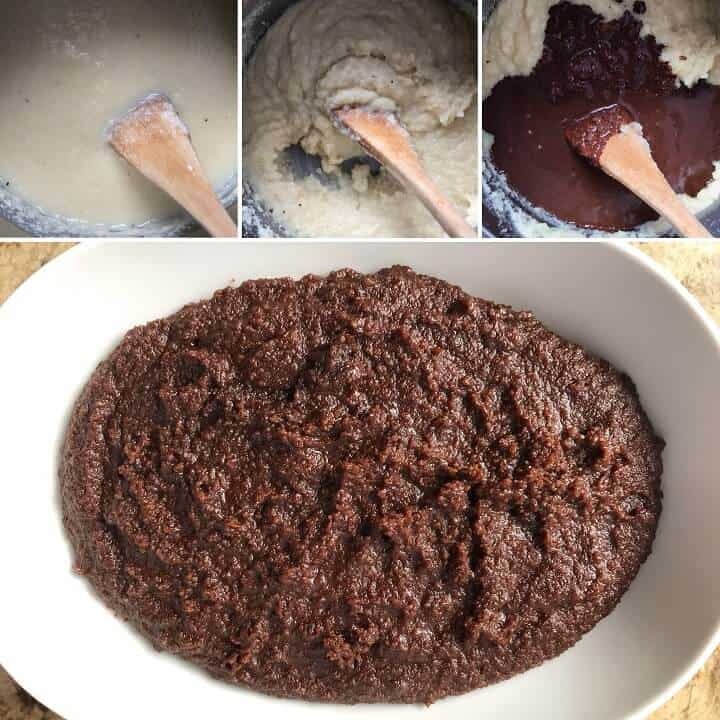 The rest of the ingredients for the filling should then be added; continue to stir until you achieve a paste-like consistency. Set the mixture aside to cool down. Please note that this mixture can be made in advance and refrigerated. Make sure to bring it to room temperature the day you are making the cozonac. There are endless variations that can be used for the fillings! Some of these ingredients include different nuts, cocoa, raisins, locum, poppy seeds… I could go on, but you get the picture. By now, our dough should have doubled in size. Punch it down and separate it in 4 sections. On a lightly floured wooden board, roll out each section into a large rectangle (about 11 x 14) and spread out the nut mixture to within 1/2 inch from the ends. Starting from the long end, roll the dough to form a log. The filling will be enclosed. Then simply repeat with the other three pieces of dough. The only thing left to do is to twist together two pieces together and place in a loaf pan. There really is no right way of doing this, let the creative juices flow and just twist away! Repeat with the other two logs. Brush the tops with a beaten egg and allow to double in size. Sprinkle a little sugar over the top before they are baked and soon you will be rewarded with some wonderful cozonac! You can ask anyone who knows me, and they will all say the same thing: I absolutely love yeast-based desserts. I also love bread and I love carbs and I’m not afraid to admit it! This bread satisfies every craving for me. It isn’t too sweet, but it is doughy and yeasty, just perfect in my books. I first tasted this bread on a recent trip to Romania with my daughter (If you followed on me on Instagram, you would have seen my Insta stories). It was lust at first sight, but love at first bite! I had had a Cozonac recipe bookmarked for the longest time, and tasting it in Romania was the push that I needed to finally bake it for myself. I am thrilled to have finally gotten around to sharing it with all of you! I now have a little piece of Romania with me to keep. And the very best thing about this recipe? It brings back golden memories of my recent trip to Romania! The original recipe can be found here. As far as changes are concerned, I used ground almonds instead of walnut, just because that was what I had on-hand. I am sure I will try it with walnuts the next time around… or perhaps the poppy seeds… decisions, decisions. If you are celebrating Easter, Happy Easter and Joyeuses Pâques to you and your family. To my friends celebrating Passover…blessings and good wishes to you and your family! And to my friends not celebrating, enjoy the long weekend! In a large mixing bowl of stand mixture, with the paddle attachment, combine about 1½ cups of flour with the yeast. With the mixer on low speed, add the eggs. Scrape down bowl and mix for about 1-2 minutes. Add the rest of the flour and knead for a few minutes. 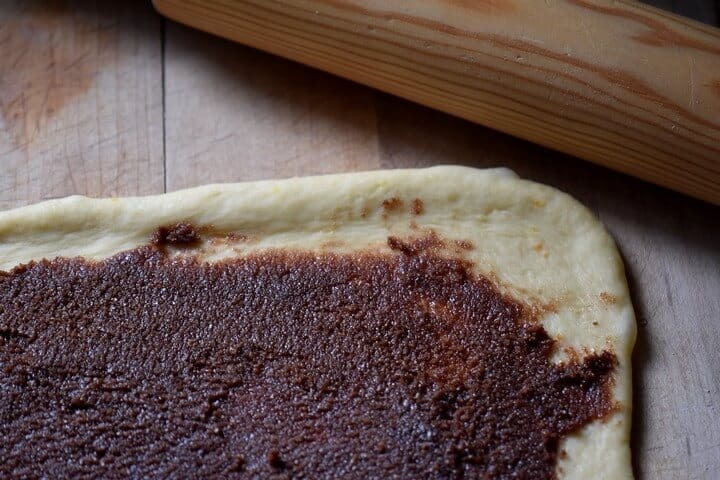 Place the dough in a lightly greased bowl (with butter). Make sure to turn the dough over in order to completely coat the dough with the grease. Add the almonds and stir until a paste-like consistency is reached. This should take about 15 minutes. Stir often. Preheat oven to 350° F. Place oven grate to bottom third. Line 2 (9 x 5 inch) loaf pans with parchment paper. Punch down the dough and divide into four equal parts. On a lightly floured wooden board, roll out each section into a large rectangle (about 11 x 14) and spread out the nut mixture to within 1/2 inch from the ends. Twist two pieces of log together and place in prepared loaf pan. Brush the tops with a beaten egg and allow to double in size. This can take 45- 60 minutes. Sprinkle a little sugar over the top and bake for about 45 minutes. Feel free to place a piece of aluminum foil loosely over the tops to prevent over browning. Allow to cool completely before slicing into them. Recipe will yield two loaves. Can use a mixture of ground nuts for the filling. I have used almond flour with great results. 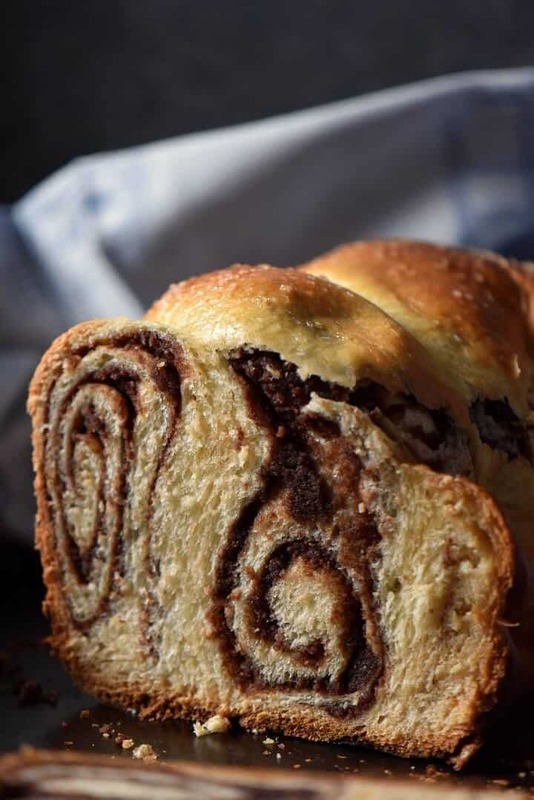 DO YOU LOVE THIS COZONAC RECIPE? PIN IT TO YOUR BREAKFAST AND BRUNCH BOARD! Making this right now, made my kitchen a mess with two babies running around but hoping this is worth it! I’ve tried making cozonac only once before and it didn’t turn out that well… but so far so good this looks a lot better than the prior one I made! Waiting for it to rise in the loaf pans than putting in the oven. It’s gonna be a late night over here but can’t wait to enjoy a slice with some milk! Keeping my fingers crossed Jessica 🙂 Thanks for taking the time to comment… anxious to hear how it turns out. That is exactly what I had heard… in fact I heard that the dough had to be thrown and beaten against a wooden board as well as being kneaded for a long period of time. Perhaps that is the authentic way of making this wonderful cozonac. What a gorgeous bread! That swirl is perfect and so tight! And I love how much orange and citrus is in the recipe. I bet this bread is really flavourful and tastes as amazing as it looks. Thanks so much Janice ♥ Let’s just say the two loaves were devoured 🙂 Thanks so much for dropping by, appreciate it! I so love seeing the similarities between people in their foods and food traditions; it often makes me wonder why we sometimes focus on the differences. A wonderful recipe and remembrance of your travels Maria. Oh yes !My mother makes similar bread for holidays ! Thank you for your version ! I only have limes and live so far from a grocery it would be impractical to make a run for just oranges. Should I wait and do this another time with oranges or go ahead with limes ? Thanks for sharing this recipe Maria. It brought back memories of my trip to Romania in 1991 when I adopted our eldest daughter. It was quite the experience. I am sure Romania has changed since then. I hope to go back someday. I too love working with yeast doughs! 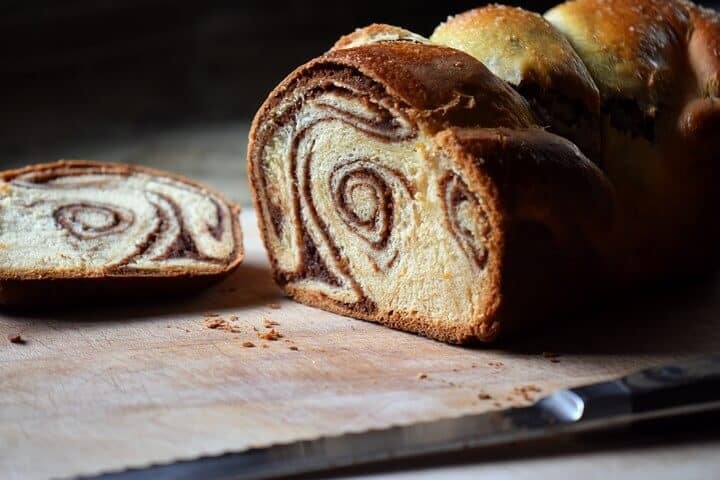 I must say that I’ve never heard of Coconac but it looks gorgeous and so delicious…it also resembles a Babka! How wonderful that you got to visit Romania, I’m sure you had a memorable time! Buona Pasqua Maria!